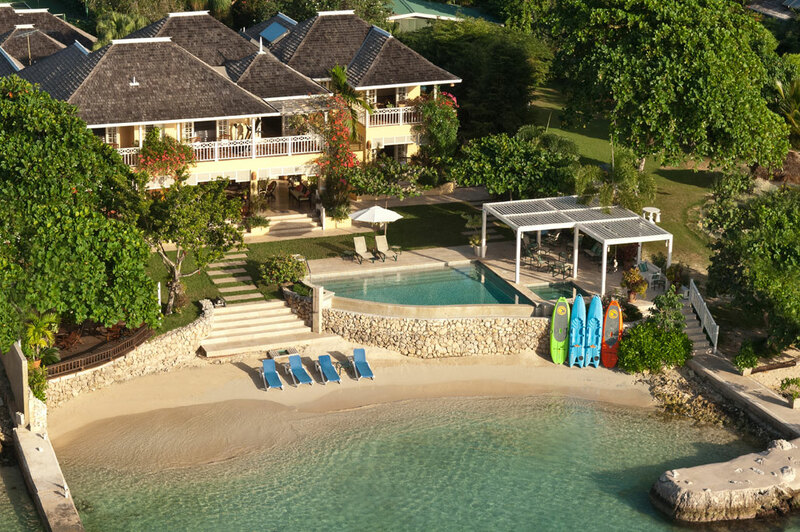 Sugar Bay is one of the most elegant villas in Jamaica. Beachfront Luxury villa, Tennis court, sea kayaks, butler service. First class service! 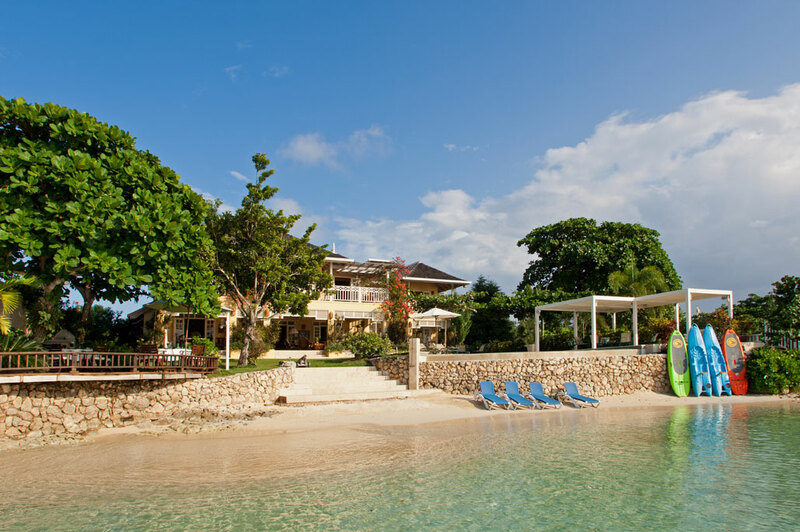 Sugar Bay Villa is a luxurious Jamaica villa with a very interesting and colorful history. The divine property has been a home to a lovely family from Ireland since the early 1800’s. The current Sugar Bay Villa was built in 1995 and is situated in a very beautiful part of Discovery Bay, the place that Christopher Columbus is believed to have first set foot on when he discovered the Americas. It is situated among other private villas along the strip, owned by prestigious homeowners. Sugar Bay Villa is an absolute waterfront property, right on the edge of the sparkling Caribbean Sea and has some fantastic things on offer! Sugar Bay Villa’s guests can enjoy fantastic views of the picturesque landscape. The amazing swimming pool has a large pool deck with a hot tub, comfortable deck chairs and loungers. The waterfront gazebo is the perfect place to sit and watch the glorious sunrises and even more impressive sunsets. A world-class golf course is very close by. The magnificent white sand beach is right at the villa’s doorstep and the guests need to only step out of the villa, for a swim right off shore. The interiors of Sugar Bay Villa have been designed exquisitely with carefully selected custom-designed furniture, hand-crafted in special workshops and manufacturing plants. Many of the pieces have been crafted with wood from the villa’s own acreage. Fabulous original art pieces from the Caribbean, Jamaica and from around the world are part of the décor. The charming villa is one of the most elegant villas in Jamaica. 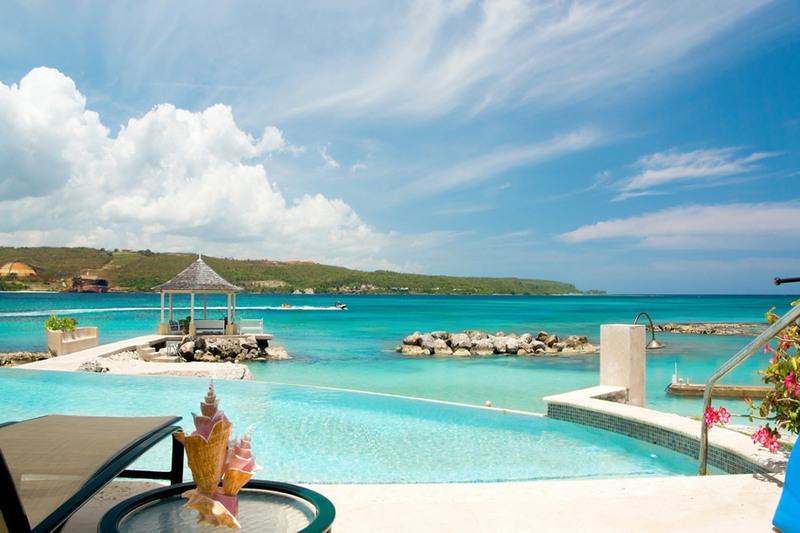 Sugar Bay Villa is a deluxe five bedroom home, with 5.5 bathrooms. Each bedroom’s interior walls have been decorated exclusively by the extraordinary designer. The master bedroom has a wonderful king-sized four poster bed, a sitting area with a computer and complimentary Internet access, television, balcony with ocean views, en suite bathroom and walk-in closet. The second and third bedrooms with en suite bathrooms are located on the first floor too. The fourth bedroom is located on the ground floor and is equipped with a king-sized bed, television, en suite bathroom and lovely French doors that open into a private porch. The fifth bedroom is also on the ground floor and has an en suite bathroom, television and two double beds. Sugar Bay Villa is equipped with all kinds of modern amenities, luxuries and conveniences. The living room has a complete entertainment center with satellite television, DVD player, sound system and Internet. A magnificent sweeping mahogany staircase rises gracefully through the living room and reaches the upstairs sitting room. Three bedrooms are located off the landing. The living room area opens into a very large covered patio with a dining area and wet bar. This area is excellent for entertaining, relaxing or family gatherings. The view from the verandah is absolutely spectacular, with wonderful pool glimmers, the grassy knoll and the white powdery beach that blends into the sparkling blue Caribbean waters. A dedicated staff is available to take care of the guests’ every need. The housekeeper, cook, gardener, butler, pool man and laundress will ensure that the guests at Sugar Bay Villa have a stress free, comfortable and lazy Jamaican holiday. Tennis lovers can enjoy the Laykold tennis court with lights for invigorating night play. The complimentary kayaks, snorkeling equipment and boat deck offer many adventures and exploratory escapades. The airport is at a sixty minute drive. Undoubtedly, Sugar Bay Villa is among the top five villa rentals in Jamaica, as it has everything anyone would want from a private and luxurious Caribbean vacation. There is a seaside gazebo which provides the perfect setting for enjoying the sunsets, or just enjoying your tropical drinks, or having romantic candlelit dinners. This is an absolutely magical spot for guests. Master Bedroom Kingsize four-poster bed, sitting area with television, balcony with ocean and sunset view. En-suite bath, whirlpool tub, separate walk-in shower, double vanity basins, bidet, walk-in closet. bathroom with tub-shower combination (ocean and sunset view from shower!) and bidet. If we accept rentals with more than 10 persons the cost for each additional person over 12 years old is US$210/Night. $1000 refundable damage deposit held for security for events.